It was a debut few could dream of. They had unbelievable amount of goodwill and overt support from Mainstream Media that few political parties can boast of. Aam Aadmi Party burst onto the scene like a quintessential Bollywood hero who has everyone cheering for him when he first appears on the screen. However, little after a month of forming Government in Delhi, the AAP seems to have been crushed under its own weight. To carry the Bollywood analogy further, the script seems to have let down the hero. Actually in the case of AAP, there never was any script. All it really was, and continues to be, is a large cast of average actors who are all working according to their own script that they have written for themselves. Multiple scripts, below-average production quality and director who vacillates and flip-flops at every take will only result in disaster of a film. In the real world, this scenario leads to anarchy and break-down of systems, as has happened in Delhi. Those of us who have followed Arvind Kejriwal’s career trajectory had been warning about AAP’s dangerous script. AAP’s promises of curbing corruption and cleansing the system succeeded in hypnotising many which is not surprising given the widespread misgovernance of the Congress-led UPA. The governance vacuum left by Congress made it easy for so-called revolutionaries to stage their ‘Occupy Delhi’ movement and garner support. The same bunch of people would not have commanded the mind-share they did now, even as recently as five years ago. Complete abdication of statecraft, big-ticket corruption, and breakdown of even a semblance of governance by Congress made the call of anarchists appealing. Now that the motley group is in power, their shortcomings are more than visible to all. That they have no experience in governance was known to all. That they would not even make an effort to learn with humility and grace was not known. Arrogance and ignorance is always a very dangerous combination. Protesting against the Government about everything and anything is easy. Anybody can replace misgovernance with chaos. The challenge is to replace existing misgoverance with good governance and have long term vision. This is where AAP is failing miserably. To say ‘we are neither Leftists nor Rightists’ is not being pragmatic. It is actually being confused and opportunistic. AAP is dangerous because under the garb of ‘aam aadmi’ and Arvind Kejriwal’s routine number ‘we are nobody, we are crushed and cursed Aam Aadmi’ they are practicing politics of the worst kind. With other political parties, one knows what to expect. Some parties, like the SP and BSP, openly ask for votes on the basis of caste and religion. Congress follows divisive politics and then hopes that the divided and fragmented voters will vote for them. AAP has aped the worst that these parties have to offer. The only difference is that other parties have dropped the pretence of hypocrisy. But the AAP, with its broom and aam admi cap, epitomises hypocrisy. Arvind Kejriwal will do his aam admi number while at the same time finding nothing wrong with unconstitutional Khap Panchayats because elections need to be won in Haryana. 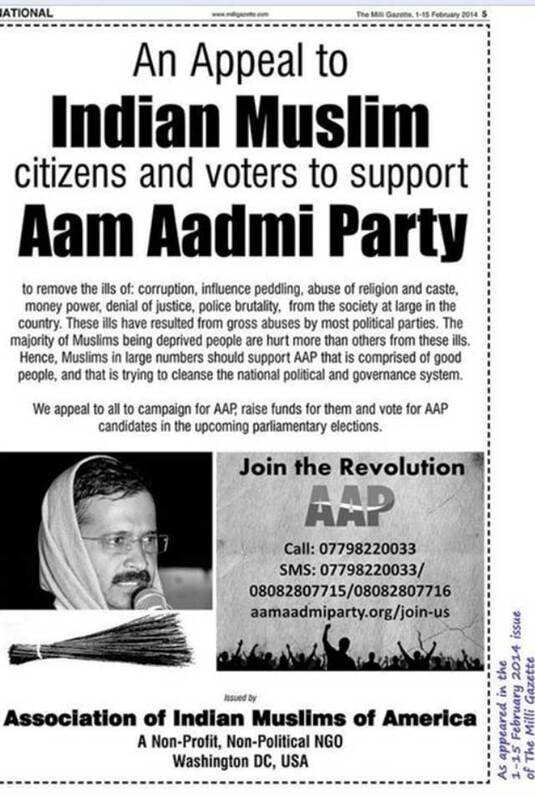 I was shocked to find this appeal in newspaper called Milli Gazette by an NGO called Association of Indian Muslims of America which is a non-profit, non-political NGO registered in Washington DC, USA. As far as I know it is illegal for NGO’s to indulge in any political endorsements overtly or covertly. Setting aside the legality of such an appeal for a moment, the blatant communalism that such an appeal reeks of, is revolting. I was not able to find any statement from the AAP distancing itself from this organisation. I looked at their press releases and searched their website but could find nothing. That any organisation could issue such an appeal for AAP says a lot about the kind of politics this party must be practicing. During the election campaign for Delhi, and when they were protesting as part of India against Corruption, Arvind Kejriwal and his team had only one issue  corruption and its removal was their panacea to all problems ranging from lack of infrastructure to declining standards of education system. Now, in power for more than a month in Delhi, Chief Minister Arvind Kejriwal’s only solution to corruption is the citizens themselves performing sting operations to trap corrupt officials and transferring corrupt officers. There is no systemic solution offered, nor is there any acceptance of the fact that corruption is merely a symptom. It is the disease that needs to be attacked in order to eradicate corruption. Our sluggish socialist economy is the biggest breeder of corruption. Arvind Kejriwal’s understanding of corruption is very shallow. One reason why Kejriwal will never win the war against corruption is because he is feeding the same socialist economic model that will only create more and more opportunities for corruption. I watched Kejriwal last week, naming politicians publicly and pronouncing them corrupt. He was the judge, jury and executioner. There was no need to prove guilt in the court of law. AAP Panchayat had ruled who is guilty and who should be publicly humiliated and defamed. I watched in horror as the names were read and his supporters clapped, screamed in joy and celebrated the spectacle. No courts were needed, no one would be given a chance to defend themselves as Judge Kejriwal delivered judgement. The Law Minister of Delhi Somnath Bharti had similarly pronounced two Ugandan women guilty of drug trafficking because of the color of their skin. Today AAP made serious allegations against senior members of the BJP and accepted that they have no evidence to back their claims. AAP MLA, Madanlal, advocate by profession claimed he was offered bribe by BJP leaders but has no evidence to back his claim. Such is the moral depravity of the party that is dreaming of becoming a viable political force in the country. Hit-and-run politics is AAP’s trademark and yet they claim to be on a higher moral ground than anybody else. AAP came with the promise of providing alternate governance. It has instead provided no governance. Chaos and confusion lead to anarchy and anarchists should never be given a chance in any mature democracy. Great observation. This party is a history now. What a mockery?